The Matilda II was the iconic early-war tank of the British Army. When it was first encountered by the Germans in France, and the Italians in North Africa, it was very bad news to them, since none of their standard AT guns did a good job at dealing with it. By the time of Operation CRUSADER however, it had gone past its heyday in fighting the Germans, and it was about to be replaced by the Valentine, which continued to serve in Europe until the end of the war if not as a main-line battle tank then as a chassis for specialised conversions, such as bridgelayer. The Matilda II however served as a main battle tank in the Pacific until the end of the war. Nevertheless, even in November 1941 in the desert the Matilda was still potent enough to be a real headache for Axis infantry and tankers, as one can see in this prior post, and it was arguably the Matildas of the Royal Tank Regiment that helped the infantry win the battle in December, while their cruiser colleagues were licking their wounds in the desert, a point well made by Bryan Perett. The views below come from the late Major Alexander McGinlay MC and Bar (see this post about how he got his first MC), a Matilda commander in 7 RTR and while not representative, are certainly quite interesting. I would like to thank his family for allowing me to auote them here. Then Lieutenant McGinlay arrived in Egypt in time for Wavell’s (really O’Connor’s) counteroffensive against the Italians in late 1940, and commanded the first tank into Tobruk. He then served in the area until the fall of Tobruk in 1942, when he was injured and captured, and again at the end of the war in a Churchill in Italy, after his escape. In the course of his service he gained the MC and bar, one during the breakout from Tobruk in November 1941, the second during the battle for Rigel Ridge. The Matilda had a high quality of workmanship going into it, the case in point here being that all tanks of the regiment started up without problems after their 5-week sea voyage to Egypt. The armour protection was very good, with the officer in question surviving a direct hit at short-range by a 105mm field gun, with the armour only splitting open at the welding seam. Until the introduction of a “new” 50mm solid shot round by the Germans, the Matilda crews seem to have been relatively unbothered by this gun. (maybe a reference to the introduction of sub-calibre rounds with higher penetration, or maybe the officer is referrring to the first encounters with the more capable 50L60 anti-tank/tank gun). In one incident a 50mm round partially penetrates the tank, cutting the hydraulics of the power traverse on the turret, leading to the crew being well covered in hot oil. The enemy had the gun advantage, but things were evened up a bit by the fact that we were better trained, in that we could, and did, fire our main gun on the move. They had to stop. So, by putting down smoke, either ourselves, or our back-up artillery, we could use the smoke to cut down the distance between them and us. When the smoke cleared, we were in among them, firing on the move. They did not like it. Our lighter armoured divisions especially took good advantage of this tactic. Smoke from the supporting artillery depended on good co-operation between the tanks and the guns. Not something the Commonwealth forces were proficient in until much later in the desert war, although it appears that the Tobruk fortress forces did very well in this regard. Smoke from tanks could be provided by the close-support tanks of which two were on strength in every squadron, normally attached to Squadron HQ. These tanks were equipped with 76mm howitzers instead of 2-pdr guns, and carried almost entirely smoke rounds. A fine book on the Matilda is Bryan Perett’s “The Matilda Tank”. Good luck getting a copy at a reasonable price – I failed and paid a lot. I am not in any way linked to the publisher of this, except that I have in the past made an order with them. Merriam has for years now provided a very good service to researchers by making available (at low cost) material that otherwise would be extremely difficult, if not impossible to get, and require mortgaging your house or selling off your first-born to pay for it, such as original unit histories written shortly after the war, or post-war studies done by German generals for the Allies. 4th Armoured Brigade History – with the chapter on the relief of Tobruk available as a free read. To order it go here – it is available very cheaply if you are happy with the PDF. If you wanted to purchase the original now, presuming you could find it, it’ll probably set you back by about 100 dollars. A discussion on the AHF (linked here) allows us to track individual unit strength of Luftwaffe (GAF) units during the campaign. This is based on three snapshots, on 11 October (before Coningham’s air campaign in support of Crusader started), on 27 November (from an ULTRA intercept, after more than a week of operations), and on 27 December, after the retreat from Tobruk and the fall of Benghazi. There are some important observations to be made. First of all, despite a major effort by the Allies, neither availability nor serviciability of the major types dropped significantly (with the exception of the Ju 88). This is likely because of a major effort in reinforcement, bringing in additional flights and squadrons, especially of dive bombers and destroyers. For the Italian air force, I have some data, which will be posted in a separate post. On 27 December the longer range planes had disappeared – in my view this is a reflection of the fuel situation, which made it pointless to keep planes in North Africa that could operate towards it from e.g. Crete. 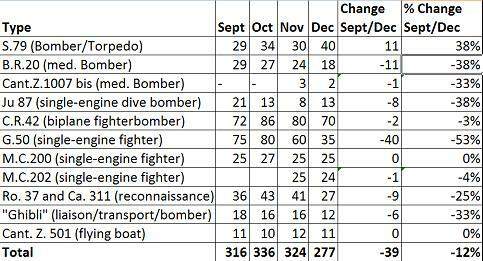 It is very interesting to see the effect of reinforcement on the destroyer availability. This is likely because these planes were used to protect convoys against air- and/or seaborne attack (with pityful results, one might add). Overall these numbers tell an interesting story, but it may not be the one usually told. The list is by unit, with the first number indicating planes present with the unit, and the second serviceable. The table below is based on the numbers above, but is not 100% accurate. I calculated this myself. 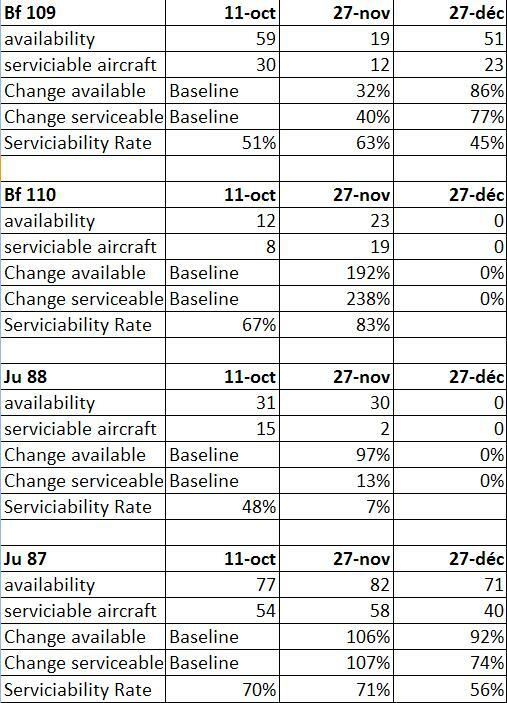 Note that the 27 November number for the Bf 109 type is understating the issue, since the data was missing from the ULTRA intercept. Also note that qualitatively the Bf 109 underwent an improvement during the battle, with the I./JG27 reporting 31 ‘Emils’, an earlier type of the Bf109, while by 27 December they reported 24 BF 109F, a much improved type, which was superior to anything the Commonwealth forces fielded in the North African theatre at the time. This of course depends on the 11 October type info being correct, something which I am having serious doubts about (it is apparently from RIng & Shore “Fighters over the Desert”.